Mimobots, the collectible figurine/USB flash drives, now have an even cooler cousin, the Mimomicro. These offer USB storage, and add an microSD card reader, too. Kids (and adults) can transfer data between phones, cameras and PCs, and be stylish about it, too. The Mimobot, available in literally dozens of popular characters, has a removable cap covering the USB. The Mimomicro, however, has a flip-down design that reveal both the microSD slot and USB plug, and a mini LED that illuminates when in use. At 1.6” H x 1.0” W, it fits neatly in a pocket or backpack pouch. It also has a tether for clipping to keychains. 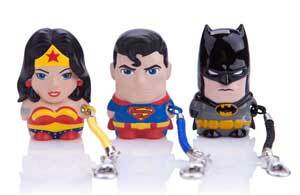 The product line launches with three DC Comics characters: Wonder Woman, Superman and Batman. And Mimomicros from the Star Wars universe include Darth Vader, Yoda, C-3PO, Chewbacca, and the Millennium Falcon. Expect many more characters to come. Prices start at $12.95 in March.